I'm a Football Consultant and Sports Media Professional with a career of close to 20 years in football business and media. Consultancy, Project Management and Public Relations for various football clubs, federations, corporate world and media with a special expertise on India / Indian football (eg. MoU between the Bundesliga and the All India Football Federation; 2014 India Tour of 1899 Hoffenheim), besides vast experiences in online media (e.g. COO & Assist. Editor-in-Chief at IndianFootball.Com), and also for print & digital (national & international) as a correspondent, columnist and football expert. The list of national and international media include the likes of the Press Association Sport, BBC World Services & Asian Network, FIFA.com, n-tv, All-India Radio, WELT am Sonntag, Mathrubhumi Daily amongst many others. Further I did also gain experiences in marketing and the advertising industry through my association with various ad agencies. 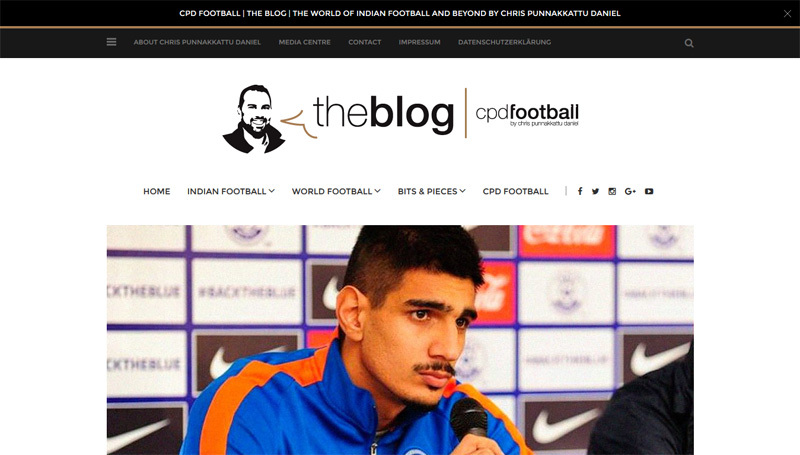 My blog blog.cpdfootball.de (previously www.chrispd.de) provides all the latest news and events from the (Indian) football world, my journeys in the business and much more. I launched the blog in 2008 as an additional playground to keep Indian football fans up to date on the beautiful game. I'm very thankful to all the fans out there who established blog.cpdfootball.de to one of the leading blogs on Indian football through their continuous support and fellowship.